As a holiday gift to ourselves and our families, we have decided that FTTDWYW will be taking this week OFF (well, kind of….)! We both severely underestimated our schedules during this season and as the season really kicks into high gear, we thought we would give ourselves the present of extra time. Which is kind of funny… since that extra time is already spoken for– from wrapping, cooking, cleaning, napping, traveling… this truly is the Holiday 500. We will, however, be premiering our latest winter playlist this Friday as a Crimmus palate cleanser of sorts. Additionally, we encourage you to check out our archives here, here, here, and here… you know… for all that free time you have this season! 🙂 So, to reiterate, there will be no new individual posts until Monday the 30th… but, again… watch for that new playlist on Friday! Among other things, this is a season of reflection and gratitude. 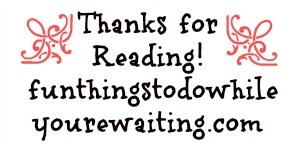 We at FTTDWYW are so grateful for the love and support of our friends, families, and readers. Without you guys, what would be the point?! Love is the greatest present you can give and we have been so lucky to have received so much of it this past year. So, from both of us to all of you, from the bottom of our hearts, thank you and have a happy holidays! 88-Day Challenge: Nearing the Finish Line Family Traditions Crimmus Playlist!